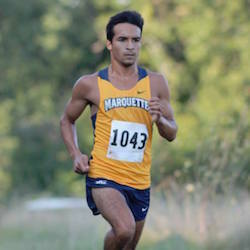 Highlights: Sept. 17, 2014 Junior Andres Tineo-Paz is the men’s top returner from last year, as his 26th-overall finish was good for third on the team. Indoor (Fr. ): Competed in the mile, 3,000 meters and the 5,000 meters during the 2012-13 indoor campaign… Posted a fifth-place finish in the 3,000 meters at the Badger Classic (Jan. 12) with a time of 8:56.21. 2013 Indoor Performance List. Outdoor (Fr. ): Competed in the 1,500 meters during the 2013 outdoor campaign. 2013 Outdoor Performance List. Cross Country (Fr. ): Competed in two meets in his first season… 2012 XC Performance List. This entry was posted in 2012, Athletic Alumni by Communications Department. Bookmark the permalink.